Yep you heard me correctly Maple, BACON, Breakfast Cookies! Mom or Dad would bring out a big plate of pancakes covered with maple syrup and a couple of strips of bacon on the side. Then you would take that first bite, a little pancake, a little bacon and maple syrup… The perfect Saturday morning bite, salty, sweet and oh so good! 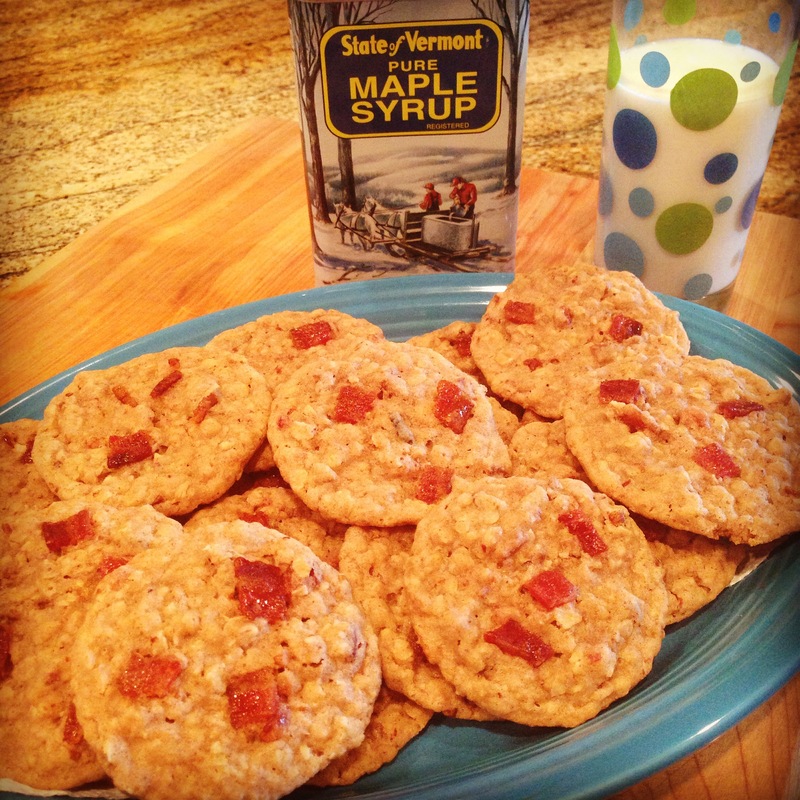 These Maple, Bacon, Breakfast Cookies will recapture those wonderful flavors of a Saturday Morning. This idea came to me last year and today I finally tested it out. These are “Breakfast Cookies” because they are packet full of Oatmeal, Bacon, Pecans, and Maple Syrup. The Cookie Dough base that I use is my Mom’s Oatmeal Cookie Recipe that I altered just slightly by adding a little butter, maple syrup and of course BACON. These Breakfast Cookies are not super sweet instead they are that perfect balance of salty and sweet with a great chewy texture from the oatmeal. I hope Y’all Enjoy and let me know what you think! Line a sheet pan with foil and place a wire baking rack on the sheet pan. Lay the 5 strips of bacon across the baking rack and bake for 15 minutes. After 15 minutes, brush the tops of the bacon with maple syrup then place back in the oven for another 5-7 minutes, until crisp. When the bacon is crisp brush the top one more time with the maple syrup. Set aside to cool. Lower the oven temperature to 350 degrees. Drop Cookies on to a baking sheet lined with parchment paper. Bake the cookies at 350 degrees for 10-12 minutes, or until they are golden brown. Good Morning Blueberry Oatmeal Muffins…. Thanks! They did make a great breakfast!